The Remembrance Bench was created to honor loved ones that have passed. 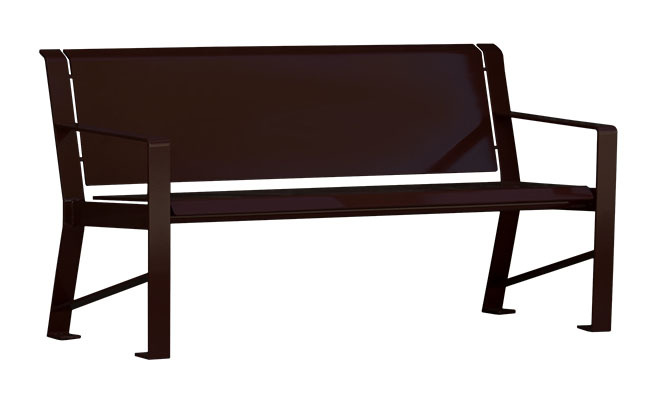 Each bench is available with fully custom design options including: powder coated colors, inscriptions, portraits, school mascots, logos, and more. To get started on the remembrance bench, call today at (801) 414-1724. The first step in designing the bench is to send us your bench ideas. Your ideas can be in the form of photos to add (as seen above), an outline describing your vision, sketches on paper, a Word Doc, etc. The designers will review all of the ideas for your bench. They will then get to work creating a mockup of how the final bench will look. The bench proof will be emailed to you for approval. The bench is laser cut from a single sheet of metal. It is then bent, welded, and powder coated in the color of your choice. The remembrance bench will then be packaged up and shipped to you. If you don’t know what design you want for the bench, don’t worry! The designer will take the time to walk you through the design options from start to finish. We also love to hear about your loved one’s life and highlights that are important to add to the remembrance bench. 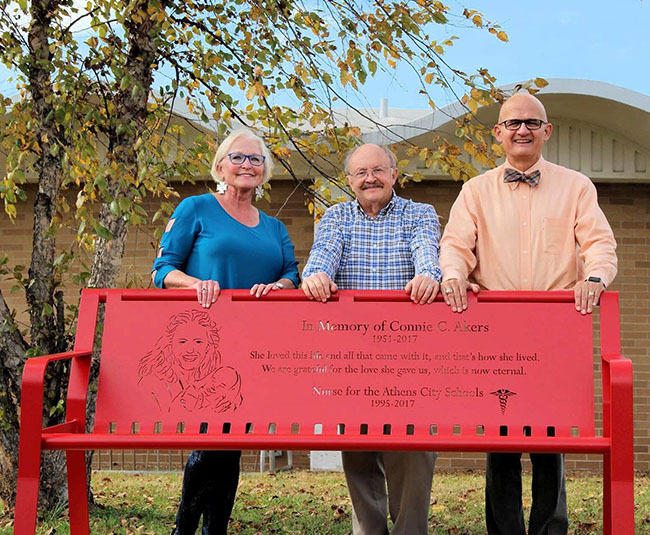 Members of Connie’s community came together to honor her memory with a remembrance bench. They raised money to order two benches for the school’s that she worked at. 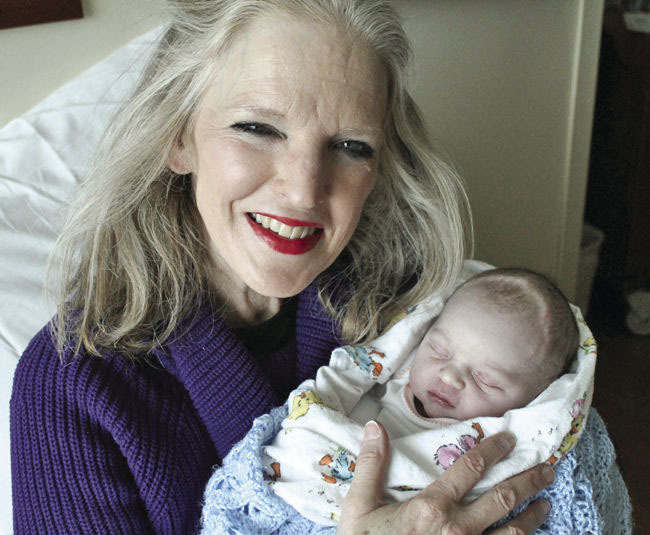 She spent over 40 years as a nurse in the public school system. Connie was also involved in the Girl Scouts, Boy Scouts, AYSO Soccer, the H.O.P.E. Center, and more. At Smith Steelworks, we felt privileged to learn a little about her life and how she served the community. 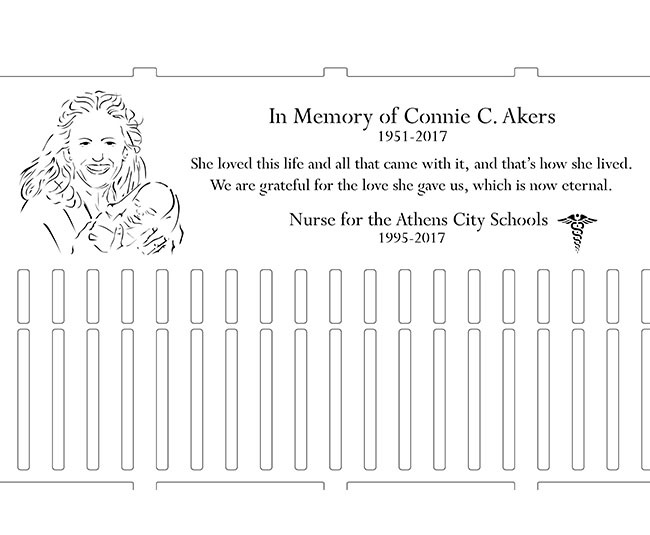 We hope that the remembrance benches will honor her life and memory. You can read more about Connie’s story here. 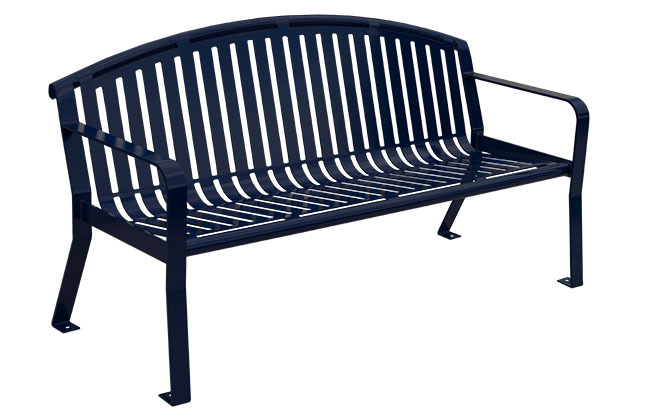 The Classic Bench is one of our most popular bench styles. It features classic slats, a straight back, and rounded armrests. The Classic Arched Bench provides extra space on the bench back. This allows for additional room for custom designs and inscriptions. 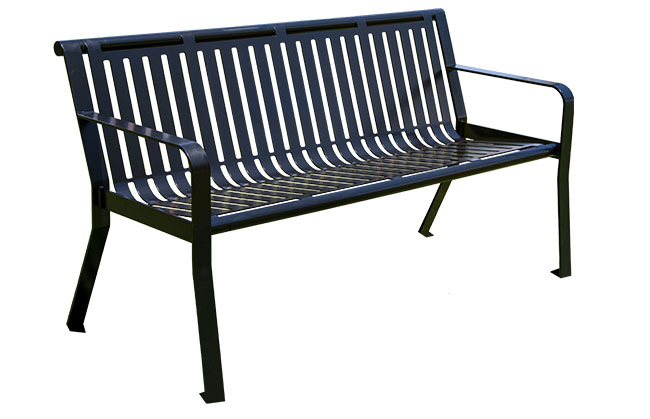 The Metropolitan Bench is a modern style that features a smooth, flat back and seat. It allows for design and color options.